So far we’ve previewed multiuser and messages & newsroom in the upcoming Backpack release. Now we want to talk about the new Page Changes feature. When you have multiple people contributing to a page it’s handy to know when and what changed since your last visit. We’ve made this really easy with the new Backpack. New stuff, changed stuff, tweaked stuff—the history gives you what you need to know about how the content has changed over time. Over the next week or so we’ll be unveiling some of the other new features coming soon to Backpack. Stay tuned. 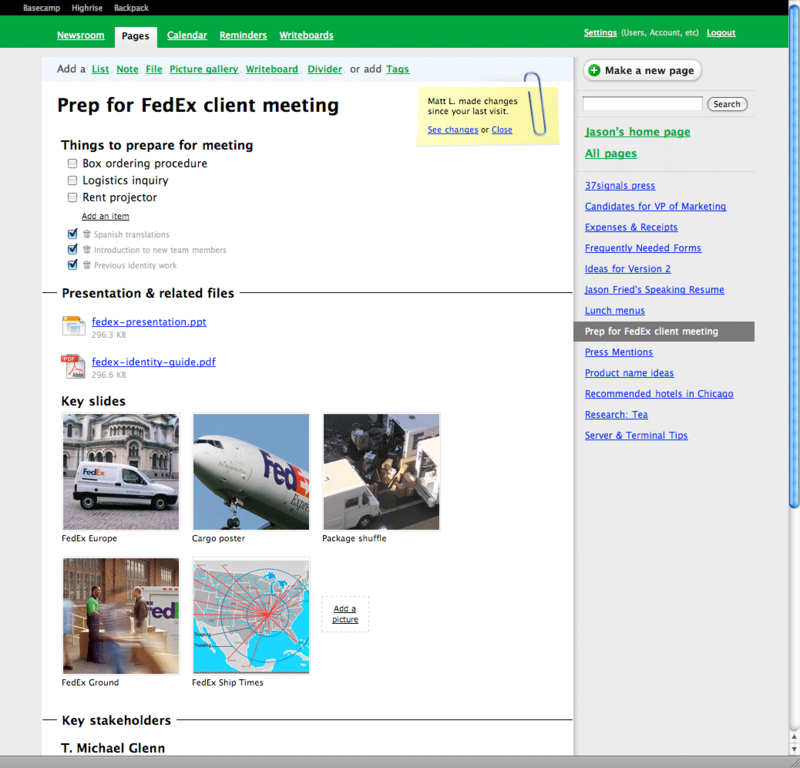 Jason Fried wrote this on Feb 13 2008 There are 59 comments. Very nice looking. Don’t go too image crazy though, I love how fast your apps work and prefer speed over fancy. Cheers. OMG! It’s the return of clippy. I thought the point of having a subscription service was that businesses don’t feel like they have to continually add features to get people to keep paying. It seems like 37signals is adding features to Backpack simply to keep paid people subscribed (and to acquire some new ones). I am a subscriber of the current Backpack. I don’t want these new features. If Backpack was a stand alone application, I would have the choice not to upgrade. But with a hosted application – I don’t have that choice. I wonder, do subscription services work long term (2+ years) on the web when our attention span is so short that we will jump ship to the next new thing as soon as it comes along. If that is the case, it creates a situation in which companies like 37signals feel required to continually add “bloat” simply in order to keep their (subscribed) customers. @Tim: You don’t have to use them. If it’s just you using Backpack, you have no obligation to add users and utilize these features. A multi-user Backpack is just that – it’s for multiple users. People who don’t wish to have multiple users won’t be burdened with the improvements and new features, their accounts will stay the same. I think the new backpack changes are fantastic. They make backpack into a usable business product, and a great evolutionary step. Naysayers, these features are not so intrusive that you need to complain about them. They seem very well designed and as an extra dimension to current backpack usage rather than modifying current functionality – kudos! I only wish you gave half this much attention to basecamp. But with all these changes it looks like backpack might be the new basecamp (honestly what would keep me on basecamp now that backpack has messaging and change history?). Let’s face it – backpack was always better designed than basecamp. The clean pages with multiple types of items make for better project organization than simple message collections and the still unintegrated writeboards. I am really looking forward to this. Tim – holy over-the-top reaction. Why don’t you wait to see how the “new” Backpack works before blasting it (and theorizing about nefarious conspiracy theories) on a public blog? Seems pretty disrespectful to respond the way you did, but I guess that’s what the anonymity of the internet affords. Great stuff – you guys continue to prove that you are leaders when it comes to focusing on the user experience and design. This is increasing the value of Backpack exponentially. I can’t wait for these updates. That clipped-on note at the top of the page is a fantastic design. Nice job. Can you take advantage of the version control features even if you’re the only one using your Backpack account? Unless the rest of the world stops developing products similar to backpack, how can 37signals just sit on the product as is and leave it unchanged? As new competing products arrive on the scene and the “other guys” are upgrading their stuff, why should 37 signals watch their users unsubscribe and go elsewhere? I’m not sure how much business experience you have Tim, but if your not moving forward, your getting left behind. @Tim: I’m not going to speak for the motives of 37signals, but I’m sure they’re building new features as much for potential customers as for those that already subscribe. I’ve never heard anyone mention “not needing to add” as an upside to subscription models. What I have heard is that the relative ease of the upgrade process is a benefit. As long as the potentially “unwanted” features are tastefully done I don’t have much of a problem. Fear of bloat alone isn’t a good reason not to add and improve. Visually speaking, something seems off…a paper clip doesn’t attach “post it” notes to paper. Although the paperclip does accentuate the yellow note…this makes it unnatural. What I think is is awesome is how organic the shape is, it’s not to square and feels 3D-ish. Great work guys…keep it coming. Love the new upcoming features so far! Gimme details on the pricing/single-to-multi user conversion. More importantly, show me one of those cool one-page-case-examples on how to convince my wife to use the Backpack calendar! I am using Backpack now and I am totally looking forward to use these new multi-user features with my colleague as our needs fit perfectly with the notion of the new Backpack as intranet. Basecamp is overkill for the small and short-live tasks we need to track for each project. I like it… I’d like to use Backpack for managing home-life stuff, but it feels too much like a personal silo. The ability to use it with my wife without the “share the same login” approach will be cool, as will knowing has changed since our last login. The paperclip feature is really cool. Well done. It’s just a shame that you’re adding it to Backpack before Basecamp where, in my own opinion, it’s more useful. Regardless, I think we all see BackCamp coming soon anyway. 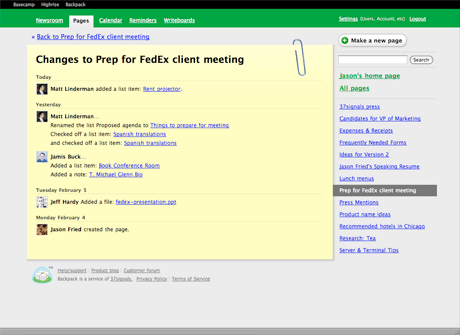 @ Josh: And why exactly would the paperclip feature be more useful in Basecamp? You can already see what has changed in Basecamp by looking at the Dashboard, so its not needed there. Why do people add comments without thinking through what they’re saying? I’m just happy that MS Word’s Paper Clip has found a new job. I only wish you gave half this much attention to basecamp. We give Basecamp far more attention than Backpack. The majority of our development time over the past few years has been dedicated to Basecamp. Basecamp remains our top priority. But we have other products too. So we’ve been spending some time improving Backpack. Backpack is our second most popular product in terms of paying subscribers so it deserves love too. I like this feature, and the graphical execution is nice—gives a bit more depth to the page. These new changes look great. I already use Basecamp with my corporate team, and Backpack for personal organization and projects. Does 37signals have any examples of why a business already using Basecamp would add Backpack to their collaboration tools? And will Backpack integrate with Basecamp beyond the OpenBar? Does 37signals have any examples of why a business already using Basecamp would add Backpack to their collaboration tools? Basecamp is your project management tool. Use it to get explicit projects done. Use it to collaborate with clients. Backpack is your intranet. Use it to share knowledge across in your organization. Use it as a shared calendar. Use it to dump all those loose bits of data everyone needs but no one can ever find. Different products used for different purposes. Just take a look at the examples in this post. These are very Backpack-centric concepts. A page of frequently used forms. A page to keep track of your receipts and expenses. A single page with notes and to-dos for an upcoming client meeting. A page to keep research for an upcoming project or presentation. A place to keep press mentions for your company or your competition. There are thousands of things you can use Backpack for that don’t make sense in Basecamp. Since Backpack currently is meant for personal use … Why not just create a new business product called “Intranet” which is Backpack + all these new business features? @Doug – feels like a bad idea – you’d have to migrate your data and it would cause even more confusion. If you don’t want to use the intranet features of Backpack, you can simply decide not to upgrade your plan and your Backpack will stay the same. It’s as simple as that. I can see this being very useful for people who do coaching. I work with a couple of different coaches, and I’ll be recommending this to both of them. It’ll give me an easy way to provide regular reports and them to monitor them, without everything getting lost in a mass of email. I could see it being quite a time saver for both sides. One query. Can email threads be limited to set users? For example, in the above example a coach may have plenty of two-way conversations they want to keep quiet. Will this work for that? If not, I hope that is something that could be considered. cool. we’ve been needing an ‘intranet’ around here but i really dread having one. on top of that i’ve never had a personal need for backpack so i’d be keen to kick the tires when these changes roll out. These new features really are great. As Yan mentioned above, I have always preferred Backpack’s workflow to Basecamp, but Backpack just didn’t have enough power to do what I needed it to do. I was just thinking a couple weeks ago that I wanted to start using Backpack for a new project, but I couldn’t share it effectively so threw it in Basecamp again. Once this launches I’ll be making heavy use of my Backpack account once again – for internal projects that don’t require client access and hour tracking that is. Basecamp is still the tool for that. As other people have said, this just makes Backpack into a Better Wiki. Posted this Q on the newsroom page and didn’t get an answer….will the changes indicator show up for forwarded e-mails as well as changes by actual users? That’d be great…. I’m not crazy about the paper clip…..it brings up bad memories of the days when I was forced to used Microsoft products, & seems to cut against the simplicity and elegance of the overall BP interface. Does history tracking mean….possibly….that BP will also get an undo for deletions? This is a req. that comes up a lot in the forums & which seems a logical extension of history tracking. Hehe. Kudos to whoever designed the clipped note graphic. I’d get rid of the paperclip but keep the yellow background. I came here to make the exact same comment! This sounds like the kind of thing we keep an “Internal” project for on Basecamp. It’ll be interesting to see if this works better. If it makes anyone feel better, forget I said sticky. Instead imagine it’s a small yellow piece of paper that requires a paperclip or it will fall down the page. It’s just a fun design element folks! 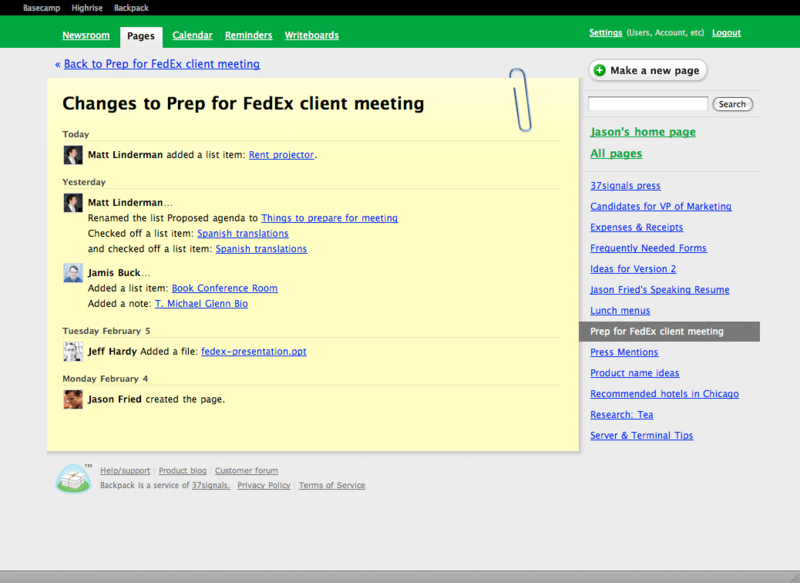 And why exactly would the paperclip feature be more useful in Basecamp? @Peter – Basecamp’s Dashboard does a good job of telling me what entity changed and when, but doesn’t highlight the actual content change nearly as well as this does. If backpack is the intranet and Basecamp the project management app, it seems cumbersome to maintain the data that overlaps both environments. Not very DRY. Tim, I’d remind you that Read/Write Web hasn’t used any of the new stuff in Backpack. No one outside 37signals has used any of this stuff. There are lots of assumptions floating around out there. It reminds me when people who never used the iPhone were already upset about the keyboard. It’s actually pretty usable and nice. Or when people were complaining that the iPhone’s screen would easily get scratched from the keys in your pocket. It doesn’t. Any talk of focus or scope or better or worse is just speculation. The new Backpack will be out soon enough and then people can judge the actual product not the assumptions about the product. Wouldn’t you prefer to base your opinion on real experiences? Why spend the time and stress and mental energy getting annoyed or upset about something that you haven’t even tried yet? You know, whenever my boss says something idiotic like, “but if its a sticky note, why do you need a paperclip?” I roll my eyes. Now I see that my boss is a genius because of his amazing depth and understanding of human nature. @Josh: Do you actually use both Backpack and Basecamp? You say that Basecamp’s Dashboard doesn’t highlight actual content change as well as the new Backpack feature, but how does content actually change in Basecamp? I thought it (BC) was purely a communication service? There is no ‘content’ in the way that there is in Backpack, except perhaps for the Writeboards and I’d imagine both BC and BC handle changes to those in the same way (and maybe BC doesn’t even track changes to Writeboards through this new feature?). Its frustrating to read posts from people who question products without understanding them properly. Look at all the people who’ve questioned the MacBook Air, claiming its useless because it doesn’t suit them. It is doesn’t suit you, don’t buy it! In the case of these changes to BP, as I understand it, everyone who uses it now can use it with exactly the same features after this new release, if they so choose. If they don’t want the new features, they don’t have to have them. Where’s the problem in that? I imagine the reason why people are complaining so much is because they have already bought it and don’t want what they bought changed. It’s even more frustrating to hear the same words of the 37signals team coming out of your mouth. Feedback is about giving one’s opinion, not repeating what others say. And I want to state that although I LOVE 37signals products, and I ENJOY reading this post, I usually expect them to give us something original. This new features are basecamp hacks into backpack, and you can give me the explanation that backpack is for intranet and basecamp for projects, but with other features explanations were unnecessary, they were neat, period. This reminds be about a certain chapter in the Get Real book. Oh, and don’t try to lean on what 37s said in the past, they’ve got that covered too! Damn, what a bunch of haters. You haven’t even had the opportunity to try the new features yet and you’re already whining. Jason, ignore these peanut gallery dorks. The new changes look sweet. When people subscribe to software and they continue to use it, the software makes money. When people buy software, it requires new software (bloat) in order to make money. How can subscription software be more bloated than one-time buy software? Release, release, release. These features are delicate! Jason, Thanks for your reply to my question about Backpack vs Basecamp. Project vs. Intranet makes a lot of sense to me. Great job. I love the product. This may not be the place for this, but where can I submit a request for new features? Sub-pages would be a fantastic addition. I use Backpack as my online “catch all.” I would like to be able to keep it a little more organized. For example I have a job search page. It contains job descriptions, emails sent directly from job boards, references, different cover letter and resume versions, points of discussion for phone interviews, details about upcoming interviews, recruiter info…you get the point. Being able to organize all this info on various sub-pages would really be convenient. Keep up the great work. As long as the paper clip doesn’t jump down and say “It looks like you’re creating a to-do list!” I’ll be happy. The paper clip works for me. I love it! The slight angle to the clip catches my eye in a way that a perfectly vertical clip wouldn’t, and gives the page a comfortable feel. These enhancements/developments are wiki, wiki good. We’ve already brainstormed ways we can integrate this into our studio system. Will you need two Backpack accounts if you wish to have personal info stored separately or can you keep some pages private? and; Will you be able to “opt out” of a shared Backpack and keep your own account? Love the nostalgia of the clip mark! I’m not one to argue for depth of purpose in every element of design (unlike my brother, who is an architect and my antithesis in that regard), but I do think sweating the deatils, especially in regard to semantics, is an important step in elevating designs. The visual element is clever beacuse it’s a real-world metaphor, and the execution is top-notch (looks gorgeous, very satisfying angle, etc), but because it is a metaphor there are certain affordances and models of understanding you’ll have to deal with. If a user says “why is a paperclip holding up a post-it” that is a perfectly valid concern—because the symbolic language you chose to display something is dissonant with their understanding of that symbol. Like JF said it’s just a fun design element, and I’m right there with him, but it is interesting that more than one person noticed it.